Who Offers the Best Shuttle in Boca Raton? When you’re in charge of entertainment, performing artists, or musicians for an event, how can you be sure that everyone will arrive there safely, on time? When you’re in charge of so many people, it can be easy for them to get the location wrong, timing wrong, get lost, or even get stuck in traffic. Instead, choose the easier option and allow M&M Limo & Airport Services shuttle in Boca Raton be your transportation choice. Hire a Shuttle Service Today! There are many reasons why hiring a shuttle service can be beneficial. Many individuals don’t think about the consequences of not hiring a shuttle service. However, due to our years of experience, we can say that we’ve seen people in desperate need of keeping their people together. With so many things that could go wrong, it’s important to know that at least your team is in the same location. With a shuttle service, you won’t have to worry about parking, traffic, paying attention, or being distracted. We offer professionally trained chauffeurs who can efficiently ensure that you get to where you’re going safely. Whether you’re here for a conference, orchestra performance, party transportation, or student transport, our team is here to help. We offer state of the art luxury vehicles to ensure that you show up in style. In South Florida, we’re one of the number one choices for all transportation needs, and with raving reviews, why choose anyone else? We’ve been in business since 1989, meaning that you’re not hiring just anyone. You can rest assured knowing that you’ve hired the best transportation company to assist with your shuttle needs. We know that it’s important for your event to go as planned, that’s why we’ll make sure that we take great care of you, and your passengers. We’ll be sure to thoroughly coordinate, and keep in touch. At M&M Limo & Airport Services, we offer a plethora of services, from limousines, to sedans, to SUVs, to party buses, to shuttles. When you’re in charge of a number of people, the easiest way to decrease stress is to invest in a shuttle company that can keep all of your guests together. This will ensure that you’ll be able to arrive on time, start on time, and leave your event as a collective. If you’re in need of a shuttle in Boca Raton, choose the most efficient option. There’s no reason to be overwhelmed. Call the experts today. Posted in Airport Transportation, Boca Raton, Car Service, CNN, Driver, Limo, Limo Service, Limousine, Palm Beach County | Comments Off on Who Offers the Best Shuttle in Boca Raton? There simply isn’t anything like riding around in style, especially in the best that limousines and chauffeurs have to offer. At M&M Limo & Airport Service, we pride ourselves in being South Florida’s one stop shop for the most luxurious ride for any type of personnel. We offer luxury sedans, vans, limos, and SUVs, and with many return customers, we know why our business seems to flourish each and every year. There are many different reasons one may need the exceptional service of a limousine in South Florida, however no matter what your needs are, we know that we can fulfill them, leaving you happy, safe, and with an experience to remember. Your favorite band is in town and you’re looking to live the experience to the fullest. M&M Limo & Airport Service has you covered. There are so many complications when it comes to driving to and from a concert, such as the traffic, expensive and confusing parking, and not to mention the enjoyment of drinks once you arrive. With a professional chauffeur, we can help you and your friends feel like the rock star you are. South Florida is home to many businessmen and women, especially as Miami is an international city for international affairs. It can be frustrating to rent just any car when you and your coworkers arrive. Many drivers don’t know where they’re going and could inevitably get you lost. Our highly skilled drivers can get you and your team where you need to be, giving you the space and ease of working on the way or relaxing after a long day. We pride ourselves on punctual and availability whenever you need us. Allow M&M Limo & Airport Service to get you to and from your meetings, the airport, or to your accommodations. There are many evenings out that may require a limousine. Whether it’s classy and sleek or a party bus you’re looking for, we can help you out. During a date night, or an evening out with friends, parking and traffic are two things that you certainly don’t want to pay attention to. Luckily, our focused and responsible chauffeurs can make sure they pick you up, drop you off, and get you home safely, all in impeccable timing. Valentines Day is arriving shortly, as is wedding season. If it’s your sweetheart’s favorite holiday of the year or the biggest day of your life, M&M Limo & Airport Services won’t let you down. We know how important these memorable moments are, and we’ll provide an exceptional service so that your loved ones only remember the best. At M&M Limo & Airport Service in Boca Raton, we offer unparalleled service, attention to detail, staff professionalism, and breathtaking customer performance. With many returning customers and over twenty years of experience, we’re South Florida’s leading company for your transportation needs. Call us today for the best limousine service in South Florida. Avoid a DUI By Hiring a Car Service in Boca Raton! One of the most prevalent crimes in the state of Florida every year is also one of the most preventable. The rate of people driving under the influence of alcohol is alarmingly high in our state yet it is easily one of the most avoidable crimes. In 2012 alone, more than 61,000 Floridians were arrested and charged with a DUI and had their life turned upside down as a result. Hire a Limo Service in Boca Raton today! Florida law stipulates that someone’s first DUI warrants a one-year license suspension and a fine ranging anywhere from $500 to $2,000 depending on the circumstances. Some cases also require community service and mandatory substance abuse treatment. Those who make the decision to drive drunk a second time face far more serious fines and punishments which could very well include jail time. Along with the fines, paying fees for your legal representation can push the overall cost of a DUI past the value of the car you were driving at the time. Some report the total cost of fighting a DUI charge at a whopping $10,000 when it’s all said and done! Rather than empty your bank account and rely on friends for rides, doesn’t it make more sense to hire a car service to chauffeur you about after a night of revelry and merriment? M & M Limo is one of the most reliable names in transportation in Boca Raton. With a fleet of luxury cars and limousines, M & M Limo is well equipped to handle transportation for any occasion. You could rely on a taxi service to get you home after a night on the town, but there’s no guarantee you’ll be able to find one when the time comes. Scheduling a car service means our experienced drivers will be exactly where they need to be every time. Don’t squeeze the party into a tiny cab, enjoy the luxury and convenience of the transportation services provided by M & M Limo. Hiring a designated driver not only brings your chance of getting a DUI down to 0%, but it also helps keeps the roads safer for everyone. Whether you’re enjoying a nice dinner with someone special, attending a concert or dancing at your favorite club, M & M Limo has the experience to get you home safe and sound. With the perfect vehicle for every occasion, it’s no secret that M & M Limo is one of the most trusted car services in Boca Raton. Call and schedule your car service today! Posted in Alaska Air, Allure of the Seas, American Airlines, Car Care Council, Carnival Corp., CNN, Costa Concordia, Costa Cruises, Curacao, Delta Air Lines, DOT, fees, Flagship Check-In Experience, Fort Lauderdale-Hollywood International Airport, Miami International Airport, News, Oasis of the Seas, Palm Beach International Airport, Past Events, South Florida Events, Spirit Airlines, Sports Column, Travel, Wi-Fi | Comments Off on Avoid a DUI By Hiring a Car Service in Boca Raton! Start the New Year with Luxury in Mind- Book Your Limo in Boca Raton! Boca Raton is known for its beautiful sights, and for its heavy traffic. At M&M Limo & Airport Service Inc. we don’t think you should spend 2017 fighting traffic. Make this year the year you treat yourself to the most luxurious and professional limo services! Our professionals at M&M Limo & Airport Service Inc offer more than just a limo in Boca Raton, we offer dedicated transportation services that encompass the quality you deserve. When you’re ready to enjoy elegance in your transportation, it’s time to call our experts at M&M Limo & Airport Service Inc. When should I call for a limo in Boca Raton? Any event that calls for elegance calls for the best limos in Boca Raton! At M&M Limo & Airport Service Inc, we operate a fleet of comfortable and classy limos, helping us to provide the best limo services around. Are limos in Boca Raton the best choice for airport transportation? Heading to the airport and traveling on airlines can be stressful, but your airport transportation doesn’t have to be a challenge. At M&M Limo & Airport Service Inc, we’re focused on bringing ease to your airport transportation needs. Our limos are the perfect fit for any airport, cruise or train transportation! Ready to reserve your limo in Boca Raton? It’s easy! Simply call our reservation hotline at (561) 488-6014. We can help you choose the perfect limo rental for your needs. Whether you’re heading to the airport, to a meeting or to a special event, our limo rentals are the best fit. 2017 can be your most luxurious year yet, thanks to our limo rentals in Boca Raton! Posted in Boca Raton, Car Service, CNN, Corporate Transportation, Driver, Limo, Limo Service, Limousine, News, Palm Beach County, Party, Party Limo, Past Events | Comments Off on Start the New Year with Luxury in Mind- Book Your Limo in Boca Raton! For most people, corporate travel is the means by which they get from Point A to Point B. But at M&M Limo & Airport Service Inc, we believe that corporate travel in South Florida can be more than a monotonous drive from one place to the next. With our luxury SUVs in South Florida, you can sit back, relax and enjoy the ride! Whether you’re taking a ride to the airport or you need to move an entire team, you can count on our luxury SUVs for your corporate travel. 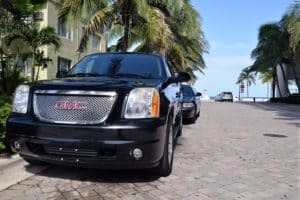 Why choose luxury SUVs in South Florida for corporate travel? At M&M Limo & Airport Service Inc, we believe that travel should be an enjoyable experience, no matter how small the journey. This is why we operate a varied fleet of top quality SUVs, cars and shuttles as well. Our vehicles are meticulously maintained, making them the perfect fit for corporate travel of any size and distance. For example, if you’re bringing employees on a retreat for the day, our SUVs in South Florida are the best choice for this transportation need. Our SUVs can fit up to 6 individuals, making them a great fit for team transportation. By choosing our SUVs for this type of corporate travel in South Florida, you can rest assured that your entire team will arrive on time, a requirement that’s absolutely vital for many corporate outings. SUVs are also ideal for airport transportation, providing plenty of room for all passengers, their checked luggage and their carryon baggage as well. All of our SUVs in South Florida provide affordable prices and unsurpassed luxury when it comes to your corporate travel needs. What about entertainment transportation needs? Our team at M&M Limo & Airport Service Inc knows that corporate transportation isn’t always about airports and meetings. Sometimes, corporate transportation is about providing elegant and luxurious transportation solutions for entertainment needs. If you’re spending a night on the town, if you’re heading to a banquet or if you’re providing transportation to special events for your employees, you can depend upon our corporate transportation solutions at M&M Limo & Airport Service Inc. Our luxury SUVs are the best fit for these transportation needs. With our prompt service and professional demeanor, there’s no better choice than M&M Limo & Airport Service Inc! If you’re looking for the very best solutions regarding corporate transportation in South Florida, don’t hesitate to call on our team at M&M Limo & Airport Service Inc. You can reserve your luxury SUV in South Florida by calling (561) 488-6014.